It's been a busy few weeks for Star Wars™ Battlefront™ II. We’re excited to have launched the game to the world, but recognize that there have been some challenges along the way. We have learned a lot, and are making adjustments to the game to ensure the best experience possible. 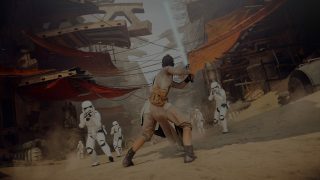 On Tuesday, an update is rolling out that begins the Star Wars™ Battlefront™ II The Last Jedi Season by kicking off factional challenges, letting you choose a side and start competing for rewards as either The First Order or The Resistance. Daily Login Crates will now provide more crafting parts than before. You'll notice the change right away when you log in. Crafting the Star Cards you want will help make sure you're progressing in the direction you want, and we absolutely want to empower that. This should help you get where you want to go faster when it comes to crafting and upgrading. And, of course, Iden Versio returns in Star Wars™ Battlefront™ II Resurrection during the days of the First Order’s rise to power. These new chapters of Star Wars™ Battlefront™ II’s single-player story mode will be available December 13. Thank you again for your passion around this game. Star Wars™ is special to all of us, and we all want to experience that world in fun, exciting ways. If you're already playing the game and are loving it, we want to thank you for taking the time to do so. We have a lot planned, and are excited to show you what’s to come. Keep your eyes on EA Star Wars™ on Twitter, Facebook, and Instagram for much more of what’s coming to Star WarsBattlefront II or join the discussion on the official forums.